You are here: Home / Delete Dating Sites / How to Delete Tinder Account? Before moving on to the procedure to delete Tinder account lets know something about Tinder first. It is a dating app that connects to your Facebook account and then uses the information from your Facebook account and creates a Tinder profile. By accessing your location, it helps you find the person using Tinder dating app around you connect with them and chat with them. If you find someone interesting, you right swipe them if the person whom you swiped right also swipe you right then you have found your match, and you can start messaging them. It is one of the widely used dating application these days. Tinder claims that it registers more than 1 Billion swipes per day. 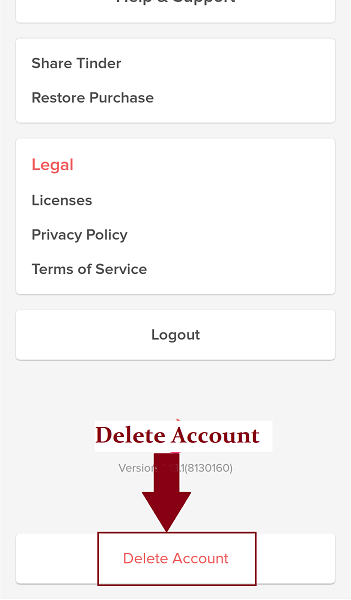 If you want to cease using Tinder, the account we are here to help you to delete Tinder Account by using a smartphone. Deactivation and turning off discovery won’t stop other users find you. 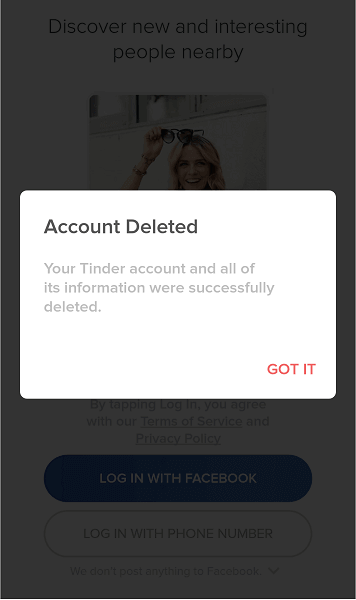 You have to remove entire Tinder Account permanently to avoid other get you in Tinder. But before you delete Tinder Account keep in mind that once you delete Tinder account, you will no longer be able to see the matches you have found and conversation you have made. So, if you think you might need any of them in future, you’d better backup them first. Access? 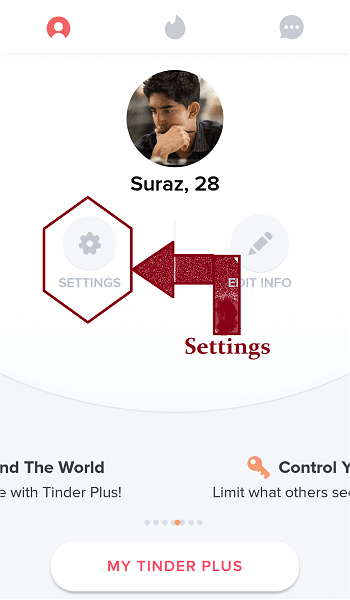 Tinder on your smartphone by tapping on the Tinder app. Go to your profile. Tap on the profile icon on the top right of your homepage. Move to settings Page by tapping on settings icon that lies just below your profile picture. Click on the Delete Account?option at the bottom of the settings page. Confirmation sub-window will appear to click on ‘Delete‘. Select the reason for leaving Tinder account and confirm. Tinder account will be deleted then. Are these steps clear? If not see the steps with a picture that will help you to?delete Tinder account?using Tinder mobile application. Open on the Tinder on your smartphone by tapping the “Tinder” icon. Go to your Tinder profile. To go to the profile, click on the profile picture shown in the top right corner of your home screen. Tap on Settings option (Gear icon) just below your profile picture to reach to the settings page. After you reach to the settings page swipe down to the bottom of the page and then tap the ‘Delete Account‘ option. 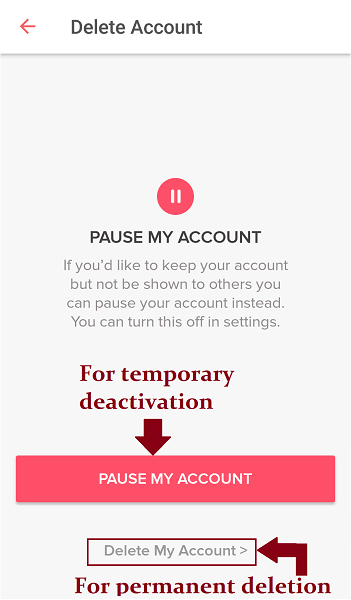 Once you tap on Delete Account, account deletion page will appear that will provide you two options; either to pause your account?for a while or to delete the account permanently. If you choose to take a temporary break and have the intention to return to Tinder then tap on?Pause My Account otherwise tap on?Delete My Account. Tinder will now ask you the reason for leaving Tinder account. You will not be able to proceed further without selecting the reason. Therefore, choose one of the reasons for deleting Tinder Account. If you choose “Others”?option, you have to type the reason by yourself. 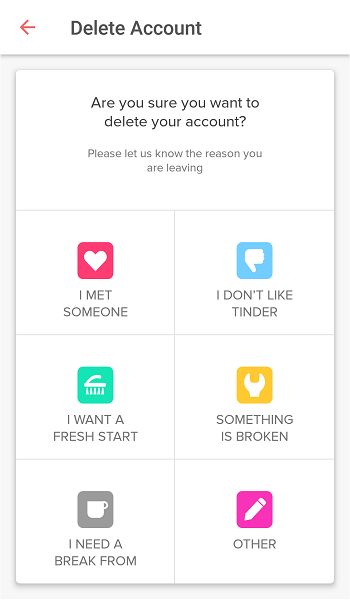 Therefore if you have a specific reason to delete Tinder account and you want Tinder company to know about it then select?Others?option and provide the description thereof. Otherwise, you can select any one of them randomly. After you choose a reason, a confirmation screen will appear. Tinder will finally provide you with the option either to delete your account permanently or to hide it temporarily. 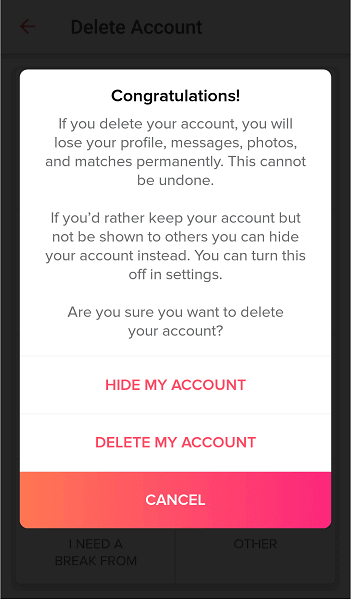 Tap on?“Delete My Account”?as a final confirmation to delete your Tinder account. Your Tinder account is now deleted. An account deletion message will be displayed on your phone. In any case, if you want to use Tinder again you can easily do so; all you have to do is open Tinder application and then connect it to your Facebook account or provide your mobile number. However, this will not restore all the previous information and history that you had in your Tinder account.